"Original publication date April, 2008. Reviewed March, 2011." Cashew-Apple Fruit Growing in the Florida Home Landscape 2 southeastern Asia and northern Australia. It is likely that Spanish explorers spread the plant to Central America and the Caribbean basin. Cashews were first imported to the United States from India in the early part of the 20th century. Cashew nut is an important item of commerce, however, in the past the cashew apple was of primary interest, not the nut. There are areas of the Caribbean, South and Central America and East Africa, where trees are still grown solely for local cashew apple consumption. Importance: The major cashew producers are India and Brazil. However, cashew is an important commercial crop in east Africa (e.g., Mozambique, Tanzania, Kenya), southeast Asia (e.g., Vietnam, Indonesia), Central America (e.g., Costa Rica, Guatemala), and some South American countries (e.g., Peru, Venezuela, Colombia). Caution: Homeowners should not attempt shelling and consuming the cashew nut produced by cashew trees grown in the home landscape. The shell contains a reddish-brown, viscous, oily liquid composed of various phenolic lipids. This oil is poisonous and acts as a powerful vesicant, causing extensive blistering of the skin (dermatitis). Removal of the kernel from raw nuts requires special precautions and procedures. The sap from the wood, leaves, and flowers may also cause dermatitis and the smoke from burning any part of the tree is poisonous. Under ideal tropical conditions the cashew is an attractive, erect, 20to 35-ft. evergreen tree with smooth brown bark and a dense, symmetrical, spreading canopy. Branching occurs very low on the trunk, with the lowest limbs often touching the ground where they can take root. More usually, where conditions are less than optimal, the tree grows to no more than 15 to 25 ft. and can develop an ill-defined trunk and a spreading, straggly growth habit. There are two main cashew tree-types: Gigante (giant) or Tardio (late), which are large, vigorous trees, usually flowering in their third year from planting, and Anao (dwarf) or Precoce (precocious), which are smaller trees that begin to bloom and fruit in their second or third year from planting and may bloom more than once per year. Clonal dwarf types or cultivars have been selected for in Brazil and India and are ideal for the smaller yard, but these are not presently available in the U.S. Where soil conditions permit (e.g. deep sandy loams), the tree develops a pronounced taproot. The oolitic limestone that underlies the thin soils of Miami-Dade precludes substantial development of a taproot. Cashews rapidly develop an extensive system of lateral roots that reach far beyond the edge of the tree canopy. The leaves are green and simple, arranged alternately toward the end of the stems, with a short petiole (stalk). Each leaf is 6 to 7 inches long, obovate to obovate-oblong with a rounded or sometimes notched tip, leathery, smooth and pliable (coriaceous), with prominent veins. There are usually 3 to 14 leaves on each terminal stem. Leaves become fully mature 20 to 25 days after emerging. Cashew flowers are borne on 4to 8-inch terminal panicles bearing 5 to 11 laterals. The panicles consist predominantly of male flowers (~60%) and some bisexual (perfect) flowers (~40%). There are rarely any female flowers. Male and bisexual flowers usually have a single large stamen and 5 to 9 smaller ones. There may be 200 to 1,600 flowers per panicle. Flowering may occur over a 30to 60-day period. Individual flowers are sweet-smelling and small with usually five yellowish-green sepals and five pinkish, reddish or whitish petals, each about 0.4 inches long. The petals turn pink and become recurved as the flower fully opens. The terminal flowers open before the lateral flowers. On opening, flowers are receptive to pollen for several days. The stigma is immediately receptive; however release of pollen occurs later, favoring cross-pollination. Cashew-Apple Fruit Growing in the Florida Home Landscape 3 The true fruit is a kidney-shaped nut consisting of a double-walled shell (an outer, thick exocarp and an inner, hard endocarp separated by a resinous, cellular mesocarp), surrounding an edible kernel: the cashew nut of commerce. The nut is pink at first, changes to green, then becomes a greenish grey then grayish brown as it develops. As the nut approaches maturity, the stalk (or, more accurately, receptacle) above it becomes swollen and fleshy, forming the 2to 4-inch, yellow and/or red, juicy, pear-shaped accessory fruit known as the cashew apple. Great care must be exercised in handling raw nuts, since the shell contains a poisonous, thick, caustic oil, which can cause severe dermatitis in susceptible individuals. Gloves should be worn when removing the cashew nut from the cashew apple. Note that cashew is in the same family as Brazilian pepper and poison ivy, both well known as capable of inducing severe allergic reactions. Cashew flowering is always preceded by new leaf and shoot growth (i.e., cashew flowers on the current season's shoot growth). Cashew trees commonly flower during the spring in south Florida. However, trees may flower after prolonged dry periods. In more tropical climates that are wet on and off throughout the year, flowering can occur at any time. Although the bisexual flowers are self fertile, they require cross pollination. Cashew flowers appear to be both insectand wind-pollinated; it is not known which pollination method is more important under south Florida conditions. Flowers open between 8:00 AM and 2:00 PM; cool temperatures may delay flower opening. About 70% of the bisexual flowers fail to set fruit, resulting in only 1 to 6 fruit per panicle. The overall fruit set of seedling trees generally ranges from 3 to 12%. However, cashew flowers can be hand pollinated to increase fruit set. The time from flowering to cashew nut maturity is about 50 to 60 days and it takes another 20 to 30 days for the cashew apple to mature depending upon ambient temperatures. In countries where cashew is grown commercially, different varieties and or seedlings are grown. In south Florida, few if any named cultivars are available and seedlings or air-layers of seedling material are grown. There may be marked variation in shape, color, and size of the cashew apple from different seedling cashew trees. Cashew is best adapted to seasonally dry tropical climates, with optimum growth occurring at temperatures from 63F to 100F and a relative humidity of 65-80%. Trees are drought tolerant but production is improved if sufficient soil moisture is provided (either rainfall or irrigation) during fruit set and development. The tree will not tolerate even short exposures to frost (freezing temperatures). Annual rainfall between 27 to 78 inches is optimal, though trees will survive with as little as 2 to 15 inches of rain. More important than the amount of rain is its distribution throughout the year. Under irrigated conditions the best quality cashews are produced during dry periods. This is because frequent rainfall during flowering and fruit development may result in severe fruit disease problems. However, watering trees without getting the foliage, flowers, and fruit wet is beneficial to fruit development and production. Finding viable cashew seed may be problem. If viable seed is available, this is the easiest method of propagation; the seed is obtained by separating the nut from the ripened cashew apple. Because of the toxic compounds associated with the shell of the nut, gloves should be worn when removing the nut (seed). The unshelled nuts (seed) are dropped in a bucket of water and left for 5 to 10 minutes; those that float are discarded. Seeds that sink can either be planted immediately, or sun dried for storage. Dried seed should be placed in an airtight container with wood shavings, for storage in a cool dry place. Stored seed should be used within 7 to 12 months and soaked in water for 24 hours before planting. 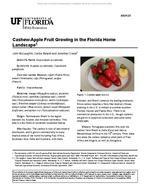 Cashew-Apple Fruit Growing in the Florida Home Landscape 4 Seed propagation is most successful during the part of the year when soil temperatures are warmest. It is usual to sow seeds directly in the ground during summer since seedling trees are difficult to transplant without damaging the brittle roots. Seeds should be planted about 2 inches deep; use 3 to 4 seeds and expect germination after 2 to 4 weeks. Allow the seedlings to grow until they are about 6 inches tall, then select the most vigorous plant and remove the other two. If containers are used, choose those that are biodegradable, such as peat pots. After the seeds germinate, remove the weakest two seedlings and allow the remaining plant to grow to about 12 inches tall, then place the entire peat pot containing the seedling tree into a 3-gallon container. When the plant grows to about 3 to 4 feet, it may be planted in the ground. Growing young seedlings under light shade may facilitate early plant growth and establishment. Trees should be planted in full sun. To increase the success of planting young trees purchased from a nursery, prune off 1/4 to 1/2 of the tree canopy. This will reduce the potential water demand by the top of the plant, reduce planting shock, and facilitate plant survival. Since seed-grown plants do not come true to type, vegetative means are required to propagate superior varieties, with air layering being the preferred method. Air-layers are most successful during summer and peak shoot and leaf growth. Removing some leaves a week in advance of severing the air-layer from the tree increases the chances that it will survive once placed in a container to develop a more extensive root system. Stem cuttings can be used to propagate cashew; however it is important to use a light, well aerated growing medium, and to provide shade from direct sun and continuous high humidity (e.g. misting). Best results are obtained when semi-mature wood is used. Though this method is not as common, trees can also be patchor shield-budded and sideor veneer-grafted. Budding and grafting should be done immediately prior to sprouting of new buds. Seedling trees usually begin fruit production after 3 to 4 years. Wet weather during flowering and fruit set will severely reduce yields, and under Miami-Dade conditions it may be desirable to adopt a spray program to protect the flowers and fruit from fungal attack. The time from flowering to cashew apple harvest is usually 2.5 to 3 months depending upon temperatures. Cashew apples become sweeter if they are allowed to ripen on the tree after they mature. However, tree-ripened fruit can fall to the ground, at which time it rapidly spoils within a day or two. For this reason it is advisable to remove fruit by hand at as a ripe a stage as possible, where trees are being grown for the cashew apple. Canopy exposure to full sunlight is required for optimum and reliable flowering. The yield of a given tree is a function of the number of bisexual flowers produced. It is important for backyard growers to remember that since most of the flowers produced are male, the yield of fruit may appear far less than expected compared to the amount of bloom. In countries where trees are grown commercially, cultivars are being developed with increased numbers of bisexual flowers. As with other fruit trees, it is quite common for some of the developing fruit to drop from a cashew tree before it is ready to harvest. A mature tree is capable of producing about 50-75 lbs of fruit (cashew apple plus nut). Cashew trees in the home landscape should be planted 15 to 20 feet or more (4.6 to 6.1 m) away from buildings, electrical wires, or other trees. Cashew trees are well adapted to many well-drained soil types and trees growing in light sand and limestone soils produce satisfactory yields. However, cashews grow best on deep, well-drained, sandy soils with a pH of 4.5 to 6.5, whereas trees growing in the limestone-based soils (pH 7.4-8.5) of Miami-Dade County may develop nutrient deficiencies of iron, zinc, and manganese. Cashew trees are moderately tolerant of occasional flooding and can withstand excessively moist soils for brief periods, but will fail to thrive on poorly drained soils. Cashew-Apple Fruit Growing in the Florida Home Landscape 6 equipment or a backhoe. Plant as described in the section above. Many areas in Florida are within 7 feet or so of the water table and experience occasional flooding after heavy rains. To improve plant survival, consider planting fruit trees on a 3to 4-ft-high by 4to 10-ft-diameter (0.6to 0.9-m by 1.2to 3.1-m) mound of native soil. After the mound is made, dig a hole 3 to 4 times the diameter and 3 times as deep as the container the tree came in. In areas where the bedrock nearly comes to the surface (rockland soil), follow the recommendations for the previous section. In areas with sandy soil, follow the recommendations from the section on planting in sandy soil. To promote growth and regular fruiting, mature cashew trees should be periodically fertilized and watered. Insects and diseases should be controlled only as needed (Table 2). A calendar outlining the suggested month-to-month cultural practices for cashew is shown in (Table 1). Cashews respond well to fertilizer, but there are no specific recommendations for south Florida, and the following are suggested based on experience with related fruit trees grown in south Florida (Table 2). In Florida, young trees should receive fertilizer applications every month during the first year, beginning with 1/4 lb (114 g) and gradually increasing to one pound (455 g). Thereafter, 3 to 4 applications per year in amounts proportionate to the increasing size of the tree are sufficient (Table 3). Fertilizer mixtures containing 6 to 10% nitrogen, 6 to 10% available phosphoric acid, 6 to 10% potash, and 4 to 6% magnesium give satisfactory results with young trees. For bearing trees, potash should be increased to 9 to 15% and available phosphoric acid reduced to 2 to 4%. Examples of commonly available fertilizer mixes include 6-6-6-2 and 8-3-9-2. Cashew trees growing in calcareous soils should receive annual nutritional sprays of copper, zinc, manganese, and boron. Boron should only be applied at very low rates (1/300th of the nitrogen rate) because above this it becomes toxic to plants. Mixes containing copper, zinc, manganese, and boron are available from many garden centers. Iron should be applied in chelated form (FeEDDHA compounds are the best) as a soil drench 2 to 3 times per year. Cashew trees growing in neutral and acid pH soils may be fertilized with soil-applied dry materials of iron, zinc, boron, and manganese, either separately or in mixes. Copper should be applied as a nutritional spray and boron only as needed. Iron may be applied in chelated compounds (FeEDTA instead of FeEDDHA), as a soil drench, or in non-chelated form as a dry material that is watered in 2 to 3 times per year. Newly planted cashew trees should be watered at planting and every other day for the first 7 to 10 days and then 1 to 2 times a week for the first couple of months. During prolonged hot, dry periods (e.g., 5 or more days of little to no rainfall) newly planted and young cashew trees (first 3 years) should be watered once a week. Once the rainy season arrives, irrigation frequency may be reduced or stopped. Once cashew trees are 4 or more years old, irrigation will be beneficial to plant growth and crop yields only during very prolonged dry periods during spring and summer. Mature cashew trees do not need frequent watering, and over watering may cause trees to decline or be unthrifty. Little to no irrigation is generally necessary during the fall and winter. Cashew trees in the home landscape are susceptible to trunk injury caused by lawn mowers and weed eaters. Maintain a grass-free area 2 to 5 or more feet away from the trunk of the tree. Never hit the tree trunk with lawn mowing equipment and never use a weed eater near the tree trunk. Mechanical damage to the tree trunk will weaken it, and if the damage is severe enough, it can cause dieback or kill the tree. Cashew-Apple Fruit Growing in the Florida Home Landscape 9 taste. The juice readily ferments, and is used in various countries to prepare wines and distilled liquors (e.g. Brazil, Guatemala, Western Africa, India, Sri Lanka and the Philippines). Take care when handling the juice since it can permanently stain clothing. Cashew apples are a good source of Vitamin C (Table 3). Anacardium occidentale ICRAF Agroforestry Tree Data Base http://www.worldagroforestry.org/treedb2/AFTPDFS/ Anacardium_occidentale.pdf Alves-Costa, J.T. 1974. The cashew: origin, synonymy, taxonomy, and morphology. Hort. Sci. student report (nonpublished). P. 1-23. Davis, K 1999. Cashew. ECHO Technical Note http://www.echotech.org/ repositories#17:d:Cashew.pdf Jernberg, D.C. 1974. Survey of the morphology of cashew. Hort. Sci. student report (nonpublished). P. 1-17. Madhava, V.N. and M.V. Hassan. 1957. Preliminary studies on the floral biology of cashew (Anacardium occidentale Linn). The Indian J. of Agri. Sciences 27:277-288. Nambiar, M.C. 1977. Cashew. In: Ecophysiology of fruit crops. (Alvins, P. de T. and Kozlovsky, T.T., eds.). Academic Press, New York, pp. 461-477. Montealegre, J.C., N.F. Childers, S.A. Sargent, L.M. Barros, and R.E. Alves. 1999. Cashew (Anacardium occidentale, L.) nut and apple: a review of current production and handling recommendations. Fruit and Nut J. 53:2-9. Morton, J.F. 1987. Cashew apple. In: Fruits of warm climates. J.F. Morton, Publ., Miami, Fla. p. 239-240. van Eijnatten, C.L.M. 1991. Anacardium occidentale. In: Plant resources of South-East Asia: edible fruits and nuts, no. 2. (E.W.M. Verheij and R.E. Coronel, editors). Pudoc-DLO, Wageningen, the Netherlands. p. 60-64. Cashew-Apple Fruit Growing in the Florida Home Landscape 10 Cultural calendar for cashew production of mature (bearing) trees in the home landscape. Dry fertilizer1 The period from March through August is generally the best time to apply granular mixes containing nitrogen-phosphate-potash-magnesium (N-P-K-Mg). Nutritional sprays Apply 2 to 4 nutritional sprays to leaves any time from March through September. Nutritional sprays should contain magnesium, manganese, zinc, boron, and molybdenum. Iron soil drenches The period from April through September is generally the best time to apply 2 to 4 soil drenches of chelated iron material to calcareous soils and 2 to 4 applications of iron sulfite to low-pH sandy soil. Watering In general, mature cashew trees do not require watering unless exposed to intense, prolonged drought. Over watering may lead to unthrifty trees. When watering, avoid wetting blossoms or fruit: otherwise both will be placed at increased risk from fungal diseases. Insect control Monitor for infestations of beetles, caterpillars, thrips and mirids. For more information and control measures, consult your county agricultural agent. Disease control Prevent powdery mildew and anthracnose disease of emerging flowers and young fruit with timely fungicide applications. For more information and control measures, consult your county agricultural agent. Pruning Pruning to reduce or maintain trees at or below 12 ft after harvest. 1 Dry fertilizer mix which includes nitrogen, phosphorus, potassium and magnesium. Cashew-Apple Fruit Growing in the Florida Home Landscape 11 Fertilizer program for cashew trees in the home landscape. 3 1 6 0.25-0.5 1.5-3.0 6 0.5-0.75 2 6 0.5-1.0 3.0-6.0 6 0.75-1.0 3 6 1.0-1.5 6.0-9.0 6 1.0-1.5 4 4 1.25-2.5 9.0-10.0 6 1.5-2.0 5 4 2.5-3.5 10.0-14.0 4 2-4 6 4 3.5-4.0 14.0-16.0 4 2-4 7 4 4.0-4.5 16.0-18.0 4 2-4 8+ 4 4.5-5.0 18.0-20.0 4 2-4 1 For young trees, use an NPK Mg mix of 6-6-6-2, 8-3-9-2, or a young-tree or slow-release fertilizer. For mature trees, use an N-P-K-Mg mix of 6-6-6-2, 8-3-9-2, or similar material. 2 The foliar spray should contain zinc, manganese, boron, and molybdenum; it may also contain magnesium and iron. 3 Iron chelate soil drenches (iron plus water) will prevent iron deficiency; foliar sprays of iron materials are generally not effective. Nutrient value of cashew apple fruit (3.5 oz or 100 g of fruit).1 Water content 84-88% Protein 0.1-0.16 g Fat 0.05-0.5 g Carbohydrate 9.1-9.8 Total dietary fiber 0.4-1.0 g Calcium 0.9-5.4 mg Iron 0.2-0.7 mg Thiamine 0.02-0.03 Riboflavin 0.1-0.4 Niacin 0.1-0.5 mg Vitamin C (ascorbic acid) 147-372 mg 1 Morton, J. 1987. Cashew Apple. In: Fruits of warm climates. Julia F. Morton Publ., Miami, FL. p. 239.